After living in New York as a Comedian, Sara Polon, hit rock bottom and took a hard look at the direction she was going in life. Sara had an Ah-HA moment when she read the book, The Omnivore’s Dilemma, which inspired her to get involved in the local food movement. After all she grew up on her Mom’s natural, freshly cooked and delicious soup, she got the idea to come back to her hometown in Washington DC. 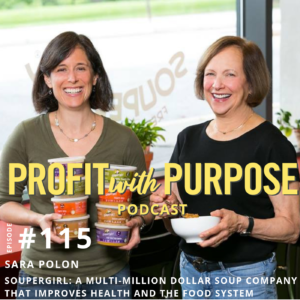 In 2008 she started Soupergirl with her mother to bring locally inspired, nutritious, and delicious soup to the hungry citizens of Washington, DC, and beyond. This mom-daughter duo can tell you, in clear conscience, that their soups are very healthy. They believe if you can’t pronounce something on the ingredient list, it should not be in the soup. Their soups are all plant-based and kosher filled with fresh, local veggies, grains, beans, and other wholesome goodness. The mission at soupergirl isn’t just about soup – it’s about our food system. Soupergirl believes in real, responsible food and supports their local farming community. So that the planet, consumer, community, farmers, and laborers all win. As they grow, they believe they can inspire even bigger changes. One spoonful at a time. Recently, they were featured on ABC’s Shark Tank. The best advice she has ever been given is to never stop believing. Someone said to her that her biggest challenge was going to be staff. She believes anticipating your company’s needs, hiring people and planning accordingly is very important for company’s prosperity. You have to be proactive and think three steps ahead.